When choosing a flat screen TV display, there are two types of screens to choose from - consumer and commercial. Of course, both types produce an outstanding quality picture but they are engineered differently. The commercial type screens are engineered to work well with a PC and their architecture supports long hours of operation. On the other hand, the consumer type screens are engineered for TV and video and are intended for shorter viewing times. The following chart identifies the general differences between commercial and consumer type displays. Commercially rated usually with multi year on-site for LCD & plasma. 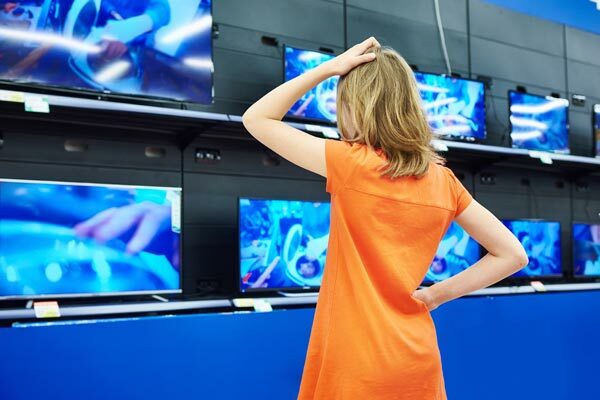 When consumer displays are used in a commercial environment, the warranty usually reverts to 90 days over the counter requiring the display to be shipped back or taken in to a service center for repair. Usually incorporates measures to protect controls in a public environment including locking of front panel and IR remote. Typically include VESA compliant standard mounting connections to complement standard industry mounting devises. Not all consumer products are VESA compliant.May need special optional mounting brackets.Third party mount compatibility is questionable. Most models build to do both landscape and portrait modes. Portrait modes are typically not available with consumer grade models. Designed to withstand long operating hours with thermal characteristics built in the internal design for proper heat dissipation in both portrait and landscape modes.Commercial plasma displays typically incorporates additional fans to dissipate heat. Designed for limited time operation with the intent of long off times.Not appropriate for 24-hour use. Designed specifically for compatibility with PCs and AV standards. Designed for compatibility regarding TV/video but will support PC usage. Most will produce a full grayscale with good linear color tracking from black to white showing all 255 different levels of luminance (brightness).This is recommended for the diversity of PC applications. Grayscale is skewed for more of the bright white end of the grayscale producing more vivid saturated color associated with TV/ Video motion. Most models recognize all PC resolutions including wide formats and different refresh rates (1024X768@ 60, 72, 75, and 85HX) in addition to TV/video resolutions. Most are designed specifically for TV/video formats with very limited PC resolutions. Most models Include standard RS232 external control/ connector, PC and video loop-through connector capability regarding multiple display configurations from a signal PC or video source, and industrial BNC locking connectors. Most do not offer external display control/connector, video loop through capability or multiple display configuration capability.Do not offer BNC connectors. EZ-DigiSign is a cloud-based digital signage solution, perfect for doctor's offices, hotel lobbies, kiosks and more! It's like having a TV channel for your business.